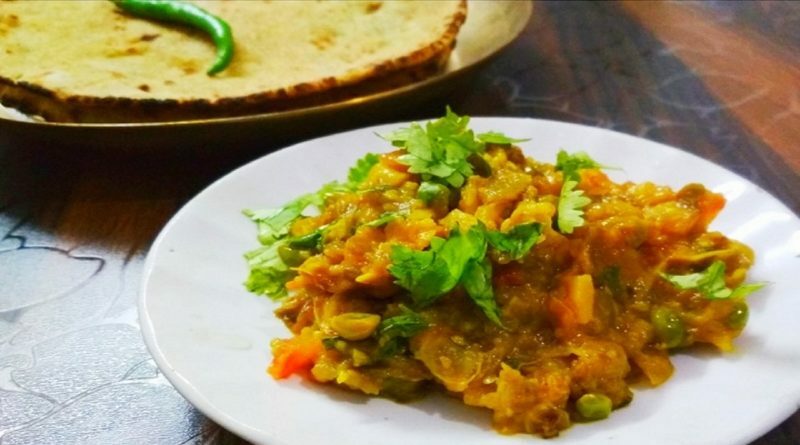 Baingan Bharta Recipe Maharashtrian is a simple and easy to prepare brinjal dish that you can prepare with simple ingredients.bartha is mesh brinjal dish. that taste yummy. in this post, you will see step by step method to prepare the dish. I am preparing the dish on fire you can use oven also. Brinjal or Baingan or eggplant – 1 large side. Onion finely chopped – small to medium size. Tomato red finely chopped – large side. 3 tablespoon of cooking oil. Coriander leaves – 3/4 tbsp. Rinse in water and dry with a napkin the eggplant. Rub some oil on eggplant for roasting and place on an open flame or a grill. On low flame keep roasting the baingan. You can also make a cut/hole in the brinjal and embed garlic cloves and then put on flame. Cooked until it turns tender. to check its cook or not insert the knife inside baingan if it slides smoothly its done. Peel the skin of roasted brinjal. Next, mash the cooked brinjal. Start with heating 2 tbsp cooking oil on low flame. Add chopped garlic, and saute. Add chopped onion and keep saute till it turns little translucent. Next, add chopped tomatoes and chopped green chili and mix it well. Keep saute the mix in low flame till tomatoes turn pulpy soft and start releasing oil from the mixture. Add red chili powder and salt, mix it. Next, add cooked brinjal and cook in low flame for more 5 minutes. Top up with chopped coriander leaves and mix it. Enjoy your bharta recipe Maharashtrian style is ready to serve with rotis. you can roast baingan in oven also.